On Saturday, October 2nd on the EAA Grounds in Oshkosh, Wisconsin a Welcome Home event was hosted for Wisconsin soldiers that were overseas this past year and their families. Greg Karch NPAA #138 organized the fishing part of the event. Also helping out at the event itself were Rick Zachowski NPAA #231 and Mark Schram NPAA #182. During the morning the NPAA Pro's worked with the youngsters attending the event at casting, fish identification and knot tying educational sessions. In the afternoon a Fishing Tournament was held for the soldiers and their families. During the Fishing Tournament over sixty fish were registered. Each child attending the event went home with a "NPAA Future Pro" T-shirt, and a rod/reel combo donated by NPAA. Other companies donating prizes for the Fishing Contest included: Mercury Marine, The Boat Doc, Offshore Tackle Company, John Gillman from Advanced Tex Screen-printing, TTI Blakemore Fishing Group and Maui Jim Sunglasses. At the event Greg Karch commented, "I am always looking for opportunities to expose fishing to young people." 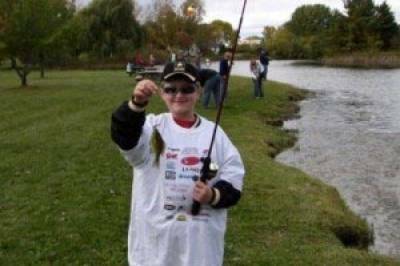 If you need help setting up a youth fishing event or you would like Greg to organize an event with you feel free to contact him via e-mail at greg.karch@thrivent.com or call him at 920-213-0373.